The month of June opened with the tundra fully green, the first time in anyone's memory that the leaves have come out so early. The plants were in for a shock, as temperatures took a dip, almost to freezing several times, rarely rising higher than the +40's for most of the month. It was generally sunny, with a stiff enough breeze to keep off the mosquitoes, just perfect for construction. As you see, our new transmitter building is really coming along! Thank you for your prayers and your financial support which have provided our mission with this building, and with the funds we needed to operate this month. God bless you! Full size HURRAY! (left) Workers began to side the new transmitter building on June 24th. The 16 ft. by 24 ft. structure is mounted on four pilings frozen into the permafrost, and held down by hurricane ties, to keep the building in place during blizzards, when the wind can routinely top 100 MPH. top of page Thank you for special gifts this past month to provide the mission with four new microphones, a new microwave link, and a new UHF receiver to pick up our Sunday Mass broadcasts. All of these contributions make possible replacement of equipment ranging from 18 to 27 years old. We still have one special "orphaned" need, an emergency communications system for our remote tower site and our truck. The cost is $2,972. Can you, or someone you know, help? Father Mark Hoelsken, SJ is moving back to Alaska to become pastor for the remote Yukon/Kuskokwim Delta villages of Chefornak, Newtok and Toksook Bay. Fresh out of college back in 1974, Father Mark first came to Alaska as a KNOM volunteer. Please remember missions like KNOM in your will. ANOTHER SUCCESSFUL SEARCH brought three young whale hunters home safely after their skiff ran out of gas. 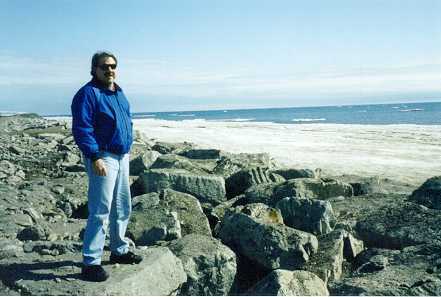 The three were located about fifteen miles northwest of Nome on the Bering Sea beach, which they reached by sail and paddle. INSPIRATIONAL SPOT: Saint Augustine once said: "Find out how much God has given you and from it, take what you need. The remainder which you do not require is needed by others. "The superfluities of the rich are the necessities of the poor. Those who retain what is superfluous possess the goods of others." 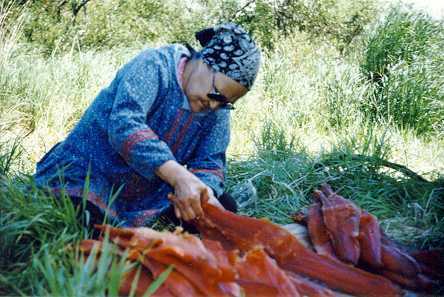 In June, KNOM business manager Florence Busch flew to her parents' home in St. Marys, Alaska, in the heart of KNOM listening country, to help her mother (pictured at left) fillet and hang king salmon in the traditional way, preserving the fish by drying and smoking. A tip of the hat to KNOM news director Tom Bunger, who earned his amateur radio license in June and can now be heard, not only on KNOM, but also on the local ham airwaves as KL0IL, joining fellow staffers Tom Busch, KL7HBC and Paul Rauch, KL0ID. There is an active ham radio club in Nome, and thanks to a couple of mountaintop repeater transmitters, folks with amateur licenses can communicate with town from as far as seventy miles away. Congratulations, Tom! INSPIRATIONAL SPOT: May He banish from the hearts of men whatever might endanger peace, may He transform them into witnesses of truth, justice and brotherly love. - Pope John XXIII. 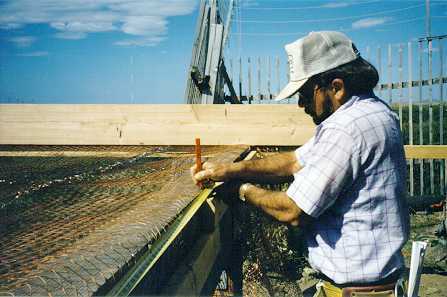 THE BEAM: (right) Foreman Fred Lammer marks off locations for the transmitter building's floor joists. Located only seven feet from the tower, the building is completely sheathed by a copper screen to reduce the level of radiation inside to ensure the safety of future workers. The first floor joists (left)are laid on top of the main beams. 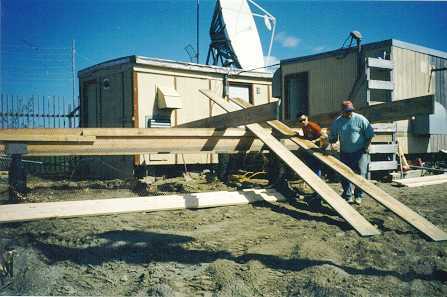 During construction, the mission continued to transmit from the old highway shed in the background, which has housed the transmitter since 1970. The old building at the right is the emergency generator shack. Thanks to the generosity of our donors in 1995 and 1996, it will be replaced by a higher-powered generator and a secure new structure later this summer, after KNOM is operating from the new transmitter building and the old structures are hauled away. INSPIRATIONAL SPOT: Lord, guide my steps in ways of grace -- that they may ever be in harmony with the music to which You have set this world. 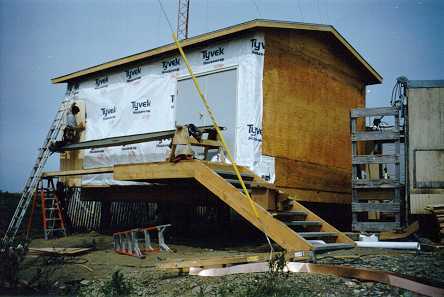 top of page 25,000 WATT UPDATE: As of July 7th, the new transmitter building was completely sided, the inside walls sheet-rocked, taped and "mudded," and both the inside and the outside were set for painting. (The inside will be white; the outside a medium blue.) By the time you read this, we expect the Nautel 25,000 Watt ND-25 transmitter to be bolted in place. In the third week of July we anticipate shipment of our antenna tuning unit. That's the 6-foot by 3-foot metal box that matches the transmitter to the antenna. Between now and the second week of August, KNOM general manager Tom Busch and the newly arrived Les Brown will work at wiring the electronics in the new building. They expect to spend a week of midnight-to-six AM's shifting over the microwave, remote control and other equipment. August 11th is the penciled date for a Nautel technician to arrive in Nome to set up and test the transmitter, and our tentative date for switching over to the new building will be the Feast of the Assumption, August 15th. GENERATOR: By about July 20th, our new 66 kiloWatt emergency generator will be on order. Following turn-up of the new transmitter building, the old buildings will be removed from the site and contractor Randy Pomeranz will start construction on a new 12 foot by 12 foot generator shed, which should be completed and ready for use by the end of September, just in time for freeze-up. Both of our new buildings have been a long time coming, the hard work of KNOM staff and the generous and dedicated sacrifice of our mission's benefactors. Thank you to everyone who has made them a reality! INSPIRATIONAL SPOT: Thomas Merton said: "His one Image is in us all, and we discover Him by discovering the likeness of His Image in one another." Full size Program director Ric Schmidt (left) took time out in May to catch a breath of fresh sea air from the newly broken-up Bering Sea, with just a bit of shorefast ice hugging the beach. Keeping on top of all of KNOM's programming is a long, grueling job, and hand it to Ric for lending a high degree of professionalism to the KNOM signal! Look for KNOM on the Internet at www.knom.org. You'll find the latest "Nome Static" with photos in color, plus lots more information and almost a hundred pictures. You can e-mail Tom Busch at busch@knom.org, Ric Schmidt at rschmidt@knom.org, and Tom Bunger at news@knom.org. From all of us, please accept our sincere thanks and our prayers for your continuing support. The KNOM radio mission --Beaming God's Love to arctic Alaska for 26 years, thanks to you. Page created and maintained by Tom Bunger.